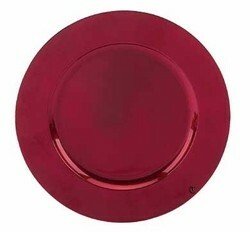 Home > Products > Tabletop Classics Round Acrylic Red Charger Plate 13"
Use the Tabletop Classics Round Acrylic Red Charger Plate 13" to give your table setting a vibrant, colorful flair. Perfect for celebratory occasions and upscale events, this product boasts a glossy red finish that provides a brilliant backdrop for a variety of dinnerware collections. Stylish and exceptionally durable, it is made from top quality, lightweight acrylic to withstand repeated use. A stylish and cost-effective solution, this charger is not only designed for aesthetics but also to protect tabletops from spills and mess. To keep this charger plate in excellent condition, hand washing is recommended.